In recognition of the July 4th holiday, the Milwaukee County Zoo will offer $4 admission to all visitors on Thursday, July 4 (the parking fee of $12 remains in effect). Families can spend quality time together on the holiday, enjoying all of the attractions the Zoo has to offer. 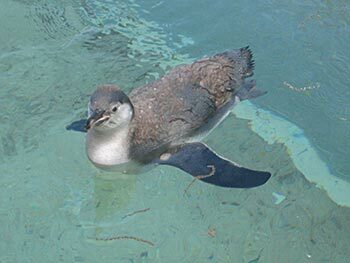 During your visit, be sure to meet our newest resident of the Humboldt penguin flock, a female named Anchovy. This 3-month-old fledgling hatched in early March, and made her public debut May 23. Anchovy is significant for a few reasons: she’s the Zoo’s first surviving chick in three years; her biological parents, Mariano and Liberty, are very young birds, so she actually became a foster chick being raised by her grandparents, Houdini and Anke! Last, but not least, she is a fourth generation penguin in the exhibit, with her great grandfather, Farley, also a flock member.